Bruce's speech titled, "Finding the Champion Within" was fitting for the audience comprised of younger employees looking to be motivated and inspired. Bruce told his story about opportunity, hard work, and determination which culminated with him being one of the most accomplished Olympic athletes ever. A Bruce Jenner personal appearance, Bruce Jenner speaking engagement, or Bruce Jenner endorsement will reflect well on your company. To hire Bruce Jenner now for any corporate appearance, fundraiser, motivational speaker event, personal appearance, autograph signing, or website endorsement please contact our celebrity agents at 1-877-6-SPORTS. We will contact Bruce Jenner or contact Bruce Jenner's agent and provide you with the booking fees and availability immediately upon your request. Direct Sportslink is the only sports speakers bureau and talent booking agency based in the United States securing only sports talent for corporations, associations, and organizations for motivational speaking engagements, personal appearances, and endorsements. We are the premier sports celebrity booking agency and a sports celebrity procurement expert. Accordingly, we will provide you with any relevant Bruce Jenner website information and booking agent details so that you can hire Bruce Jenner for your next event. Bruce Jenner captivated the world when he broke the world record by scoring 8,634 points in the decathlon at the 1976 Olympic games in Montreal and earned the title, "World's Greatest Athlete." "I love life and I want to LIVE it! Activity, variety and the next challenge around the bend --keep me excited and inspired. I wouldn't have it any other way." 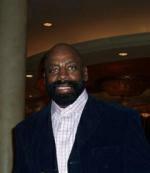 The years since his athletic achievements made him world famous, Bruce has become a highly respected motivational speaker, sports commentator, entrepreneur, commercial spokesperson, television personality, actor, producer and author. Public appearances and endorsements on behalf of a wide variety of corporate sponsors are a major part of Bruce's busy schedule. His first corporate relationship put him on the Wheaties cereal box for 7 successful years. Bruce's passion as a motivational speaker has gained him national attention. He is in demand for companies such as Merck, Coca Cola, VISA, Anheuser Busch, MCI, Toyota, Kawasaki, Maytag, Mack Trucks, Chrysler and IBM Corporation just to name a few. He enjoys and encourages corporate involvement on many levels, whether it's a media tour, appearances at company meetings or full scale advertising campaigns. Corporate and community audiences are captivated by Bruce's unique Olympic, personal and professional success story, which he highlights in speeches around the world. His message, "Finding the Champion Within," is relevant to people everywhere, whether they're high school athletes or corporate Vice Presidents. Bruce's energy translates easily into his presentations and audiences are visibly moved by his story and the lessons that have made him a success. Bruce relates easily to a corporate audience because he's been there. His first experience in the corporate arena was during his early athletic days, when he sold insurance while training. Today he's a corporate President. As one might imagine, sports continues to be an important part of life in the Jenner household. A typical day might find Bruce riding mountain bikes, or working on his current passion, golf (he's a 4 handicap). He's a commercially rated pilot who flies his own jet and he races cars professionally in Grand Prix events around the world. Television was a very natural step for Bruce after the Olympics. A guest host and special correspondent on "Good Morning America" for seven years, he cut his teeth on morning network television and exploded from there. Over the years, Bruce has been a commentator for a wide variety of shows for NBC Sports, ABC Sports, and Fox Sports, to name a few-covering track and field, surfing, motocross, and the CART Indy car races...and of course commentating for NBC at the Olympics in various countries. 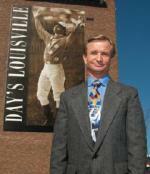 His expertise in this area landed him an Outstanding International Sportscaster of the Year award. Television exposure is only one offshoot of Bruce's international fame. He's been the subject of countless feature stories in magazines and newspapers around the world and his face is a familiar feature on the covers of magazines such as GQ, People, and, of course, Sports Illustrated. Bruce and Kris have together done hundreds of magazine and book interviews...one of their favorites is Robin Leach's Lifestyles of the Rich and Famous Cookbook highlighting "the most extraordinary people in the world?. They recently completed a new video together entitled, "Women's Self Defense and Fitness Program" and also appear in the video series entitled, "Let's Play Sports.? Bruce is also a highly regarded and successful author. His most recent release entitled "Finding the Champion Within" is a motivational book for Simon and Schuster. His first book, Decathlon Challenge: Bruce Jenner's Story, appeared on the 1977 "Best Books for Young Adults" list put together by the American Library Association. In 1980, he authored Bruce Jenner's Viewers Guide to the Olympics, a handbook to the games, which was updated for the 1984 Summer Olympics. In 1984, he completed The Teenage Guide to Fitness. A Sullivan Award winner for his outstanding performance as an amateur athlete and the Associated Press Male Athlete of the Year, Bruce is continually recognized for his varied and extensive achievements. He was inducted into the Olympic Hall of Fame in 1986 as well as the Bay Area Hall of Fame and Connecticut Sports Hall of Fame in 1994. He is also a member of the Track and Field Hall of Fame. When he's not being a great dad, husband, entrepreneur or speaker, Bruce is most likely flying his own plane, working on his golf game, or looking for new and interesting elements to add to an already full and versatile lifestyle. 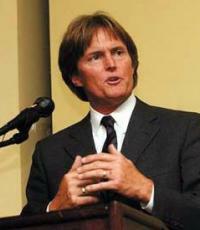 Based on your interest in Bruce Jenner as a speaker or for a personal appearance, Direct Sportslink has provided you additional links below for other sports talent with similar appearance fees, speaker topics, and categories that match Bruce Jenner.